Western Pennsyalvania is home of Icarus Witch, one of the great metal bands that has resurrected the sound of classic heavy metal in the United States. 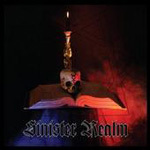 Now, Sinister Realm, hailing from Allentown in Eastern Pennsylvania, premiers with an epic disc of heavy metal. Drawing from the deep roots of great metal artists like Black Sabbath, Judas Priest, Iron Maiden, Dio, Ozzy, Mercyful Fate, and Candlemass, Sinister Realm combines elements of all to create their own blend of traditional melodic metal with some tones of doom metal. In lead vocalist Alex Kristof you can hear small bits of Ozzy and Halford, but his sound and style is clearly his own. Kristof carries the crafty, often creepy and mysterious lyrics, with strength and precision. The band marches and plunders to heavy epic metal laced with vigorous riffs, hook-laden melodies, and soaring guitar solos. There is not a single bad song here or wasted note. Into the Depths of Hell, Machine God, and Enter the Sinister Realm are only a few of the excellent metal masterpieces on this debut. The music can be as foredboding as their sinister album cover. Sinister Realm's debut is immensely entertaining and formidable classic melodic heavy metal. Very Recommended. The music can be as foredboding as their sinister album cover. Sinister Realm's debut is immensely entertaining and formidable classic melodic heavy metal.